Vegas predicted a close game as you’d expect between an 8 and 9 seed, giving Like a Botch a 60% chance of victory. All and all I’d say Vegas got this one right as Like a Botch won the series in two games, but both were hard fought wins, with the first game going into overtime. Despite Matt Carr having a great game and scoring 6 points in each game for Ball Busters, Like a Botch was too strong winning the series 12-10 and 11-9. Vegas liked Gone Fishing in this one, giving them an 83% chance of victory. The game was long and harder fought than the Vegas Odds would have indicated but in the end Gone Fishing did come out on top and win the series, you can see why by watching the highlight below. Vegas gave Glory Rollers a 67% chance of victory, but perhaps that was a little low given how hot they were going into the playoffs. Glory Rollers got the win in two games winning the first 11-8 and the second 11-4. Hard to beat a team that is making shots like this one . . . This was an interesting game. Vegas only gave Elite Ball Handlers a 66% chance of victory, which is lower than you might expect between a 3 seed and a 14 seed (look at the odds and seeds of the game above for comparison sake). This game was actually played on Thursday rather than Wednesday as Green Machine were nice enough to play around Elite Ball Handler’s busy schedule. As Vegas predicted this series was surprisingly close but Elite Ball Handlers got the win in two games, 11-6 and 12-10 requiring overtime to finally dispatch of Green Machine. Vegas loved Thunderballz in this game, giving them a 93% chance of victory. While this series was a little tighter than perhaps Vegas envisioned, Thunderballz did emerge as the winner. Winning the series in two games 13-5 and 11-7. In the end Vegas was 100% on their first round predictions. Pretty impressive. I want to say thank you to all the teams who lost, I loved having each of you involved this year. 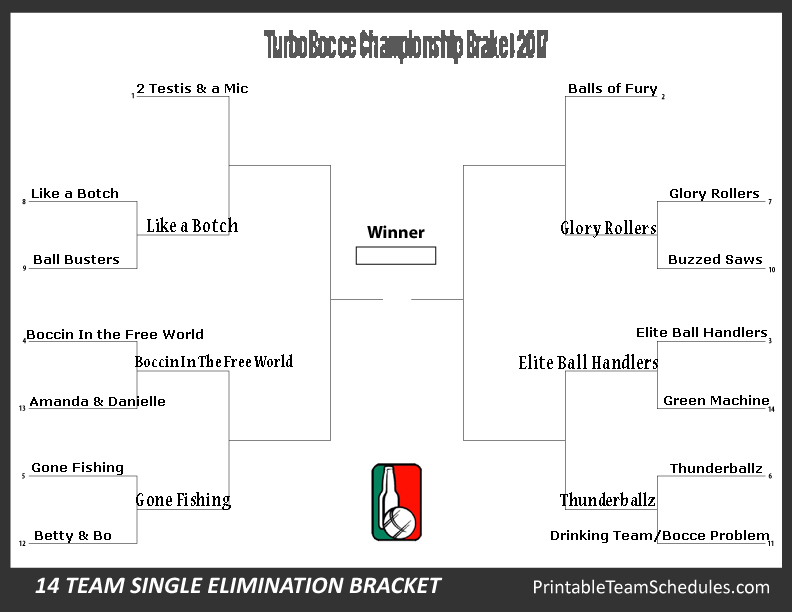 And please join us at 5pm on the 19th at the bocce field to see who our league champion is and to then join us in the Ukrainian Home for free food and drinks as we give out awards for the year! To the teams that won . . . here is the updated playoff bracket followed by the next rounds Vegas Odds! #1 2 Testies and a Mic vs. #8 Like a Botch . . . Vegas says . . . 2 Testies and a Mic has an 88% chance of victory. #4 Boccin In the Free World vs. #5 Gone Fishing . 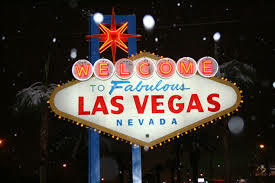 . . Vegas says . . . Coin Flip! Each team has a 50% chance of victory! Exciting! #3 Elite Ball Handlers vs. #6 Thunderballz . . . Vegas says . . . you won’t believe it, ANOTHER coin flip game! Vegas says each team has a 50% chance of victory. Side note . . . if you look at the BCS scores of the teams that rank 3-6 they are almost identical which might explain why Vegas is coming to these conclusions. #2 Balls of Fury vs. #7 Glory Rollers . . . Vegas says . . . the defending champs Balls of Fury have an 82% chance of victory. All games start on Noon on Saturday the 19th. We will be having a practice day on Wednesday and players from the Monday night league (who will be merging with our league next year) are coming to check our field out! Hope to see you there!